The unmistakable flavor of sesame seeds pairs perfectly with our brown rice and almonds to create a delicious baked cracker. 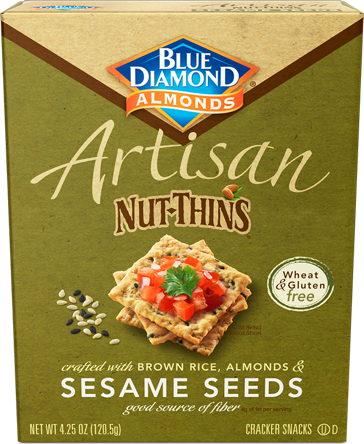 Besides great, gluten-free flavor, Sesame Seed Artisan Nut Thins provide three grams of fiber with every serving. Enjoy them with cheeses, spreads, your favorite appetizer combinations—or grab a handful straight from the box! Get inspired with our Tale of Herbs & Sesame holiday gourmet pairing featuring Sesame Seed Nut-Thins.